Merry Christmas to all!! We come to the end of another year and can’t imagine where all the time has gone. We have all been extremely busy this year but that is a good thing. We were trying for the perfect Christmas picture to send out with our cards but it never happened. I had to send the cards without a letter or picture. So here is Plan B. Drew is in 4th grade and loving “just being a regular 4th grader.” He has made his acting/dancing/singing debut this year in Annie Jr., church choir, and Waco Christmas Celebration. I don’t think he wants to admit it but he had a lot of fun. I love seeing him step out of his comfort zone and realize there is more to life than sports and math. He still likes school but mostly because he loves being with his friends. He will compete this year in UIL Spelling, Number Sense and Art Smart. Drew is now part of the preteen ministry at church. I just can’t wrap my brain around the idea of having a preteen! Evan is in 2nd grade. He also got his dads math brain. He is a whiz at multiplication and often beats the entire 3rd grade class in math contests. We think he has been seizure free for quite some time. We have had a few scares in the last year but we have been unable to determine if a seizure occurred. He has side effects from the drugs but we will deal with them in order to be seizure free. We still believe that God will heal Evan. Evan continues to feel called to be a missionary. He has an amazing heart! He loves all people and seemed to be able to easily put himself in their shoes. He has a particular love for the people of Africa. This year for Christmas, he wants all the money we would spend on him to go to others who are in need. Doesn’t that just melt your heart? Lindsay is as sweet as ever. She enjoys attending Pre-K three times a week. She loves going on field trips every Thursday. When she is not at school, she is Mommy’s shadow. Pretending and playing are at the top of her list of fun activities. She also loves to sing and dance. She is looking forward to starting “real school” in the fall. She is a true blessing to our family. Lindsay’s biggest moment this year was when she asked Jesus into her heart. She really loves God and has an amazing understanding of His love. Mark ran his first marathon this year. We were all very proud of him. He continues to enjoy working a Baylor, teaching Sunday School and coaching the boys’ teams. He went to youth camp this summer. He was able to go to Big Bend National Park with Drew and 70 other schoolmates. He worked hard to get our yard back in order after a tornado uprooted two gigantic trees in our backyard and made a mess of the rest of the yard. We mourned the loss of his grandfather in November, but it was a bit of a blessing as he had not been doing well for several months. Regina has begun working a little at Baylor this year. She works mainly with students with Eating Disorders and supervises dietetic students. She continues to work at Providence Hospital a few days a month. Both jobs are very rewarding and keep her on her toes. She still enjoys Bible Study Fellowship and volunteering. Sadly, there has been no time for scrapbooking this year. Being a mom of three very different personalities is quite challenging. This coming year will be a new experience as all three children will be in school. For the first time in 10 years, our home will be quiet during the day. God has blessed us tremendously this year. Here are some pictures from the past year, including a few attempts at a real Christmas card picture. My brother Paul and I find pleasure in the out-of-the-ordinary. This probably has been tempered somewhat by the fact that we have kids and we live more responsible lives (I do, anyway). In the past, though, my mom and sister used to fuel this by buying at least one goofy game for us each Christmas. I'm a Dave Barry fan. When he was still writing a weekly column, the Brazos Living section of the Waco Trib was known as the "Dave Barry" section, as his column was about the only thing worth reading in that section. His Christmas gift guide was especially fun. What do these have to do with each other? Well, in this year's gift guide, one of the items is a game affectionately known as the "butthead game." The thing is, he is WAAAY behind the times. 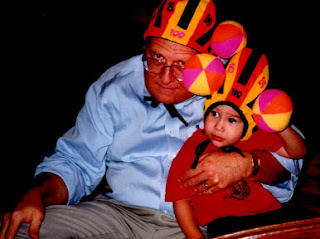 This particular family had this game years ago, as evidenced by the picture below of Drew and Papaw enjoying the game when Drew (and Papaw) was much younger. I'm guessing this is 1999. Come on, Dave, get in the 21st century. And no, Regina, we were not on any of these roads when we went for our jeep ride in New Mexico. Microsoft, if nothing else, is good for job security. For instance, read this on the Windows Vista Team Blog. I guess it's all in how you interpret the numbers, but I take the added jobs to mean that Vista is unnecessarily more complex and will require more people to support and maintain the product. Since that's what I do, that means job security. 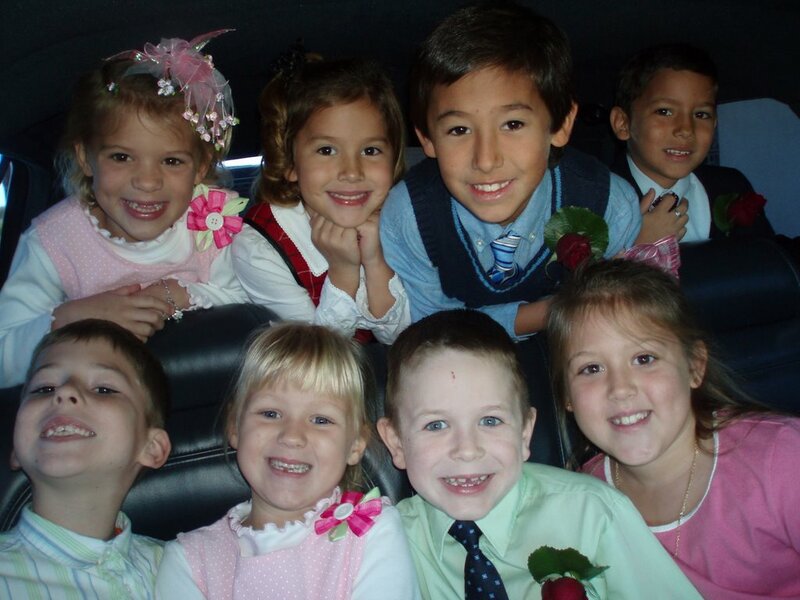 Eight of the 11 cousins living it up in a limo! Just too cute not to post. 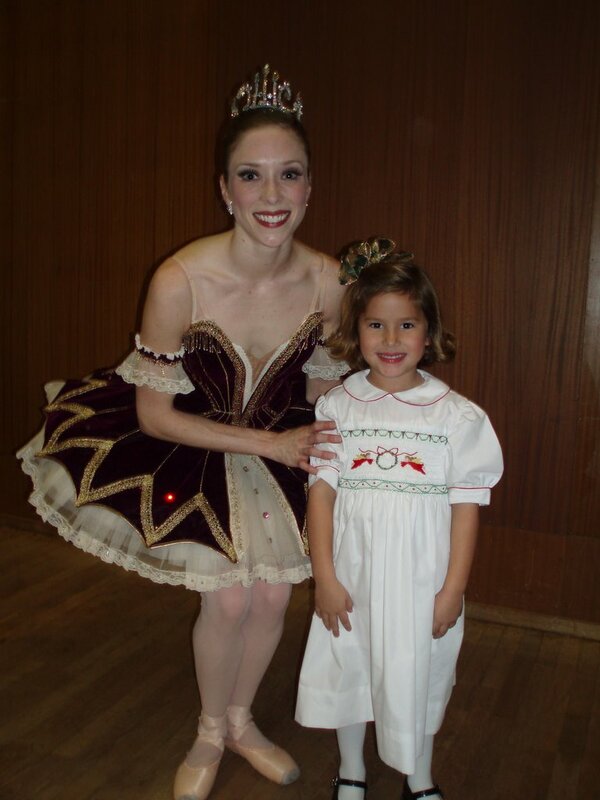 Lindsay and I went to see The Nutcracker ballet Sunday afternoon. Our dear friend, Carol Sedberry invited us to be her guests. Thanks Carol for a wonderful experience with my daughter and great memories we will always cherish! I remember going to see The Nutcracker as a little girl. I always loved the magical atmosphere created by the music, dancers and little girls all dolled up. Lindsay loved it (up until the moment she fell asleep). I neglected to tell Lindsay before the ballet that the dancers would not be speaking. A few minutes after it began, Lindsay asked "Why isn't anybody talking?" Luckily, we'd read the story and saw a movie of the Nutcracker so she knew the story line. After it was over, she said "that was so much better than the movie!" She got to take pictures with a few of the dancers at the Kids Club Party. 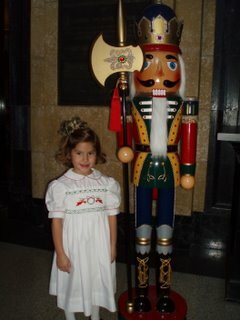 She also received a sequins Nutcracker that she adores. She takes him everywhere she goes. Looks like we may be starting ballet lessons soon. She has the bug!